Thuro Metal Products is a manufacturer of precision screw machined components; swiss and CNC swiss machining of metal components. Since 1971 Thuro has provided screw machining for many industries to include aerospace, avionics, optical, medical and energy. Single spindle and multi spindle CNC turned parts in all basic free machining materials plus alloy steels and exotic materials. Our quality precision machining now expands on its materials. Thuro is now offering machining of all grades of titanium including titanium alloy TI-6AL-4V. Specialists in manufacturing titanium tube fittings and connectors. Our metals machining expertise continues with screw machining which includes CNC turning and milling of high temperature steel 17-4PH, stainless steels 303, 304, 316 and bearing steel 52100. 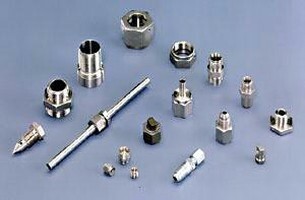 Aerospace and aircraft tube fittings and connectors, hydraulic and pneumatic; manufacturer of Dynatube tube fittings, Parker tube fittings, and Statoflex tube fittings.